The distinctive and most important features of the Flat-Coat are the silhouette (both moving and standing), smooth effortless movement, head type, coat and character. In silhouette the Flat-Coat has a long, strong, clean, “one piece” head, which is unique to the breed. Free from exaggeration of stop or cheek, the head is set well into a moderately long neck which flows smoothly into well laid back shoulders. A level topline combined with a deep, long rib cage tapering to a moderate tuck-up create the impression of a blunted triangle. The brisket is well developed and the forechest forms a prominent prow. This utilitarian retriever is well balanced, strong, but elegant; never cobby, short legged or rangy. The coat is thick and flat lying, and the legs and tail are well feathered. A proud carriage, responsive attitude, waving tail and overall look of functional strength, quality, style and symmetry complete the picture of the typical Flat-Coat. The long, clean, well molded head is adequate in size and strength to retrieve a large pheasant, duck or hare with ease. Expression alert, intelligent and kind. Eyes are set widely apart. Medium sized, almond shaped, dark brown or hazel; not large, round or yellow. Eye rims are self-colored and tight. Ears relatively small, well set on, lying close to the side of the head and thickly feathered. Not low set (houndlike or setterish). Nose-Large open nostrils. Black on black dogs, brown on liver dogs. Lipsfairly tight, firm, clean and dry to minimize the retention of feathers. Jaws long and strong, capable of carrying a hare or a pheasant. Neck strong and slightly arched for retrieving strength. Moderately long to allow for easy seeking of the trail. Free from throatiness. Coat on neck is untrimmed. Topline strong and level. Body-Chest (Brisket)-Deep, reaching to the elbow and only moderately broad. Forechest-Prow prominent and well developed. Rib cage deep, showing good length from forechest to last rib (to allow ample space for all body organs), and only moderately broad. The foreribs fairly flat showing a gradual spring, well arched in the center of the body but rather lighter towards the loin. Underline-Deep chest tapering to a moderate tuck-up. Loin strong, well muscled and long enough to allow for agility, freedom of movement and length of stride, but never weak or loosely coupled. Croup slopes very slightly; rump moderately broad and well muscled. Tail fairly straight, well set on, with bone reaching approximately to the hock joint. When the dog is in motion, the tail is carried happily but without curl as a smooth extension of the topline, never much above the level of the back. Shoulders long, well laid back shoulder blade with upper armof approximately equal length to allow for efficient reach. Musculature wiry rather than bulky. Elbows clean, close to the body and set well back under the withers. Forelegs straight and strong with medium bone of good quality. Pasterns slightly sloping and strong. Dewclaws-Removal of dewclaws is optional. Feet oval or round. Medium sized and tight with well arched toes and thick pads. Powerful with angulation in balance with the front assembly. Upper thighs powerful and well muscled. Stifle-Good turn of stifle with sound, strong joint. Second thighs (Stifle to hock joint)-Second or lower thigh as long as or only slightly longer than upper thigh. Hock-Hock joint strong, well let down. Dewclaws-There are no hind dewclaws. Feetoval or round. Medium sized and tight with well arched toes and thick pads. Coat is of moderate length density and fullness, with a high lustre. The ideal coat is straight and flat lying. A slight waviness is permissible but the coat is not curly, wooly, short, silky or fluffy. The Flat-Coat is a working retriever and the coat must provide protection from all types of weather, water and ground cover. This requires a coat of sufficient texture, length and fullness to allow for adequate insulation. 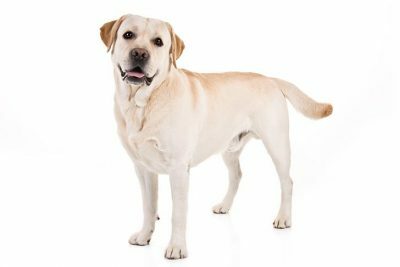 When the dog is in full coat the ears, front, chest, back of forelegs, thighs and underside of tail are thickly feathered without being bushy, stringy or silky. 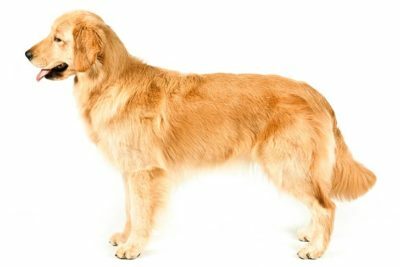 Mane of longer heavier coat on the neck extending over the withers and shoulders is considered typical, especially in the male dog, and can cause the neck to appear thicker and the withers higher, sometimes causing the appearance of a dip behind the withers. Since the Flat-Coat is a hunting retriever, the feathering is not excessively long. The Peter Pan of the Sporting Group, the forever-young Flat-Coated Retriever is a gundog of relatively recent origin. Happy, self-assured, and willing to please, a good Flat-Coat will retrieve a duck or a show ribbon with equal aplomb. The Flat-Coated Retriever’s eponymous flat-lying coat comes in lustrous black or liver, with feathering at the legs and tail. A distinctive breed hallmark is the long head—unique among retrievers—which projects a smart and kindly expression. A Flat-Coat will stand as tall as a Labrador Retriever, but in silhouette they present a leaner, more elegant look. Dogdom’s champion tail-waggers, Flat-Coats are among the happiest of all breeds. They mature slowly; some owners say that they never grow up at all, retaining a puppyish taste for rambunctious mischief into old age. This can be either delightful or exasperating, depending on your tolerance for such monkeyshines. This highly energetic breed requires lots of outdoorsy exercise. The Flat-Coat should be fed a high-quality dog food appropriate to the dog’s age (puppy, adult, or senior) and activity level. Learn about which human foods are safe for dogs, and which are not. Check with your vet or the dog’s breeder if you have any questions or concerns about your dog’s weight or diet. Clean, fresh water should always be available. The Flat-Coat’s moderate-length coat requires a weekly grooming with a brush and a metal dog comb to remove dirt and loose hair and keep the dog looking his best. The ears should be regularly inspected and cleaned if needed. The nails should be trimmed often, as overly long nails can cause the dog discomfort and problems walking and running. The Flat-Coat is an active sporting breed and requires ample exercise every day for his physical and mental well-being. This can come in the form of long daily walks and play sessions with his owner. The breed also exercises mind and body by participating in obedience, tracking, agility, rally, and other activities that can be enjoyed by dog and owner. Flat-Coats are very intelligent, responsive, and eager to please, so they are generally easy to train. They have a sensitive nature and don’t respond well to harsh corrections or training methods. A Flat-Coat wants to be with his family, and undesirable behaviors can result if he is regularly left alone for long periods of time. Early socialization and puppy training classes are recommended and help to ensure that the Flat-Coat grows into a well-adjusted, well-mannered companion. 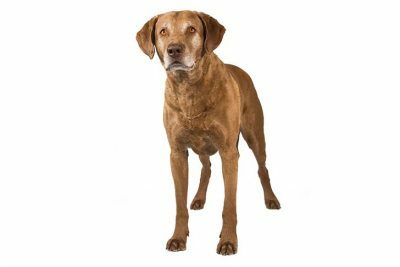 There are several health and genetic screening considerations specific to the breed. Responsible Flat-Coat breeders test their stock for conditions the breed can be prone to and communicate with other dedicated breeders regularly, working together for breed health and preservation of the breed’s unique qualities. A Flat-Coat’s ears should be checked regularly for signs of infection, and the teeth should be brushed often, using a toothpaste designed for dogs. Regular visits to the vet for checkups and parasite control help to ensure the dog a long, healthy life. 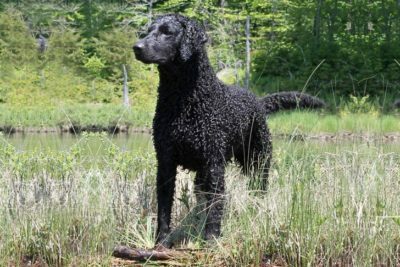 Flat-Coats are one of six AKC retriever breeds: tireless, trainable lake hunters who retrieve downed waterfowl. Retrievers mark where a duck falls and, on command, swim a straight path to the game, grip it gently in their mouth, swim a straight path back to the hunter, and deliver the prize to hand. In the park or backyard, a retriever’s hunting traits are expressed in seemingly endless games of fetch, an affinity for water, and an eagerness to work closely with an adored human. Flat-Coats were first bred in the mid-1800s, a relatively recent development in the AKC universe, where many breeds go back to antiquity. Flat-Coats were once Britain’s most popular retriever, before being overtaken by Labs and Goldens, and was once called the “Gamekeeper’s Dog” because of its widespread use on the sprawling estates of the English gentry. 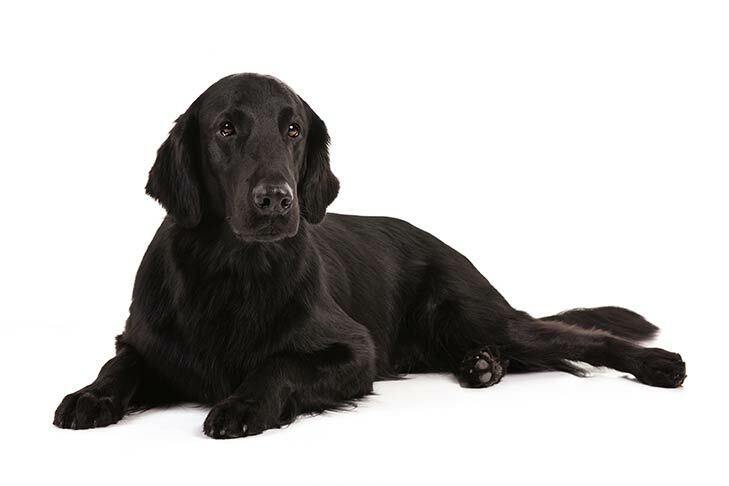 Among the component breeds in the Flat-Coat’s genetic background are the St. John’s Dog (an early version of the Lab) and various setter types. From the beginning, the coat was a striking aspect of the breed. Alternate breed names have included the Wavy-Coated Retriever, the Black Wavy Retriever, and Smooth-Coated Retriever, all referring to the breed’s unique beauty. Aside from its good looks, the coat is highly functional: it protects these superb retrievers from harsh weather, icy water, and punishing ground cover. The Flat-Coated Retriever was admitted to AKC registration in 1915. The Flatcoat's most famous patron was H. R. Cooke, who for over 70 years kept the breed in his fabulous "Riverside" kennel - a kennel perhaps unique among those for any breed of dogs in numbers, quality and awards won in the field and on the show bench. The Flatcoat developed out of the same "Labrador" family as the well-known Labrador Retriever. By 1918, the Flatcoat's popularity was overtaken by the modern Labrador Retriever, and by the end of the 1920's by the Golden Retriever. At times, particularly during the two world wars, registrations dwindled to dangerous levels. Stanley O'Neill, one of the greatest authorities on the breed, showed selfless devotion in putting the Flatcoat on as sound a footing as possible and in advising new patrons on correct type in order to build stock in the 20th century. 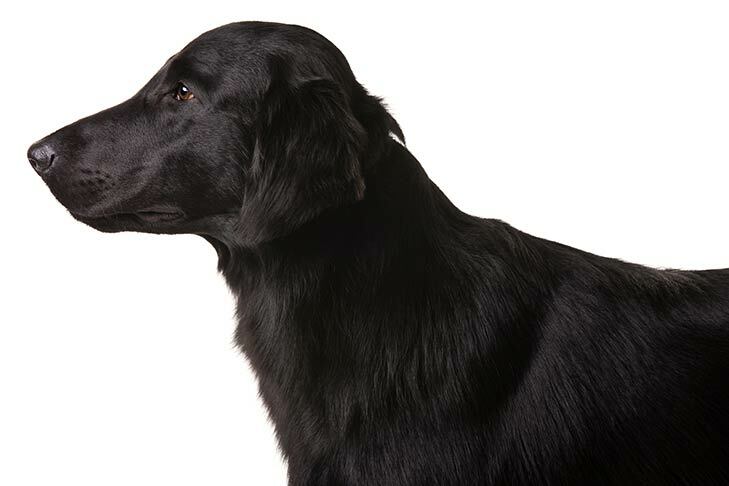 Flatcoat lineage holds evidence of Newfoundland, Setter, Sheepdog, and Spaniel-like water dogs; regarded as a "mongrel" breed for many years.